You must read, agree, and submit your electronic request using the form at the bottom of this page. For questions or comments regarding our firearm transfer services, please send an email to [email protected]. The Federal law requires that you can only arrange a transfer for yourself. You may NOT arrange a transfer for someone else. If someone else is having a firearm transferred, they must contact us to initiate the transfer. The dealer sending the firearm may NOT arrange the transfer. We do not inspect or test fire any firearms that are being transferred. Therefore, we reserve the right to refuse the return of firearms that were misrepresented by the seller. We only accept incoming shipments from current FFL holders. We do not allow non-licensees (those without an FFL) to ship firearms to us for transfer. As a transferee, you may be provided a tracking number for your firearms shipment and can track the delivery to our facility. All firearms must go through an administrative process before they are available for pick-up. We are required by the Federal law to record all firearms within a short, defined time period. We always strive to process all transfers as quickly as possible. Please be patient – we will notify you as soon as your firearm is ready for pick-up. All transfer transactions require an appointment. As a rule, we will contact you to let you know when your firearm is ready to be picked up. Please note that we do not provide transfer services on weekends. We will never hesitate to refuse a transfer or report a suspected criminal activity to the proper law enforcement agencies. 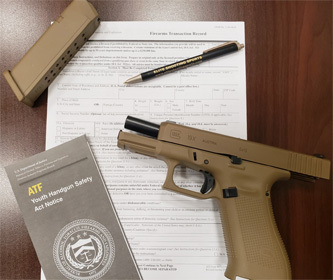 When you’re notified that your transfer firearm is available for pick-up, you will need to bring your Virginia driver’s license (or a Virginia DMV issued identification card) that displays your current residence address. Thirty days must have elapsed since the issuance of an “original” or “duplicate” driver’s license. For additional information on acceptable forms of ID, please visit the firearms/concealed handguns section of the Virginia State Police website. If you are an active duty military permanently stationed in Virginia, you will need to bring your home state driver’s license, your military photo-identification card issued by the United States Department of Defense, and proof that Virginia is the permanent duty station via current military assignment orders. Effective July 1, 2016, House Bill 810 removes the requirement that an additional form of identification to establish citizenship be presented at the time of purchase of an assault weapon.